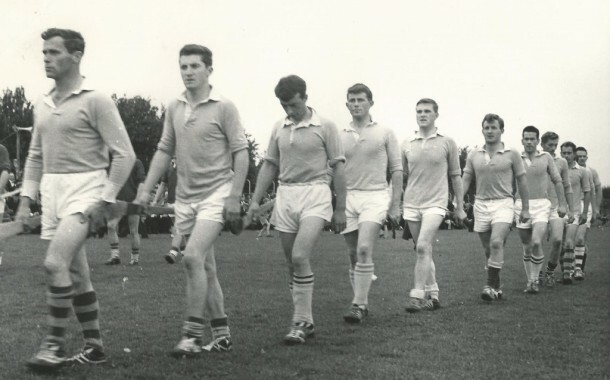 In 1964 Éire Óg bridged a seven-year gap when the Blues were crowned north Tipperary senior hurling champions following a great win over Roscrea at MacDonagh Park. Our thanks go to Enda O’Sullivan for digging up the following report from fifty years ago – this match report was published in the edition of the Nenagh Guardian dated October 1st, 1964. Éire Óg regained the county under-16 hurling titles after a two-year lapse when they overcame Holycross in the final at The Ragg on Saturday. Two years ago at under-14 level Holycross suffered heavy defeats at the hands of Éire Óg in the Féile na nGael and Toomevara in the rural final, but the two years showed a marked improvement. They played with great determination and commitment throughout and overcame the loss of their wing-back Tom Moloney to stay within five points of the north champions. But they lacked penetration in the forward line and all their points came from David Burke. 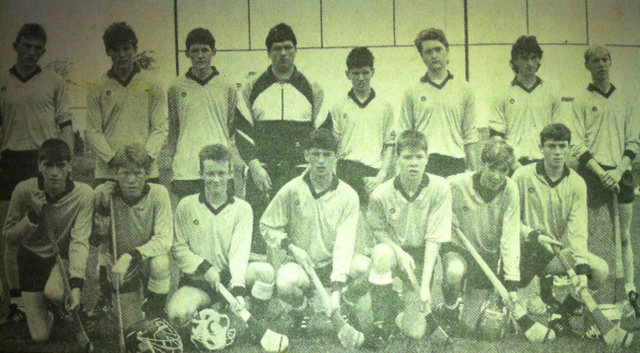 Back from left: Mervyn Scanlon, Liam Walsh, Declan O’Meara, Christy McLoughlin, Eddie Guerin, Michael Loughnane, Frank McGrath & Pádraig O’Kennedy. 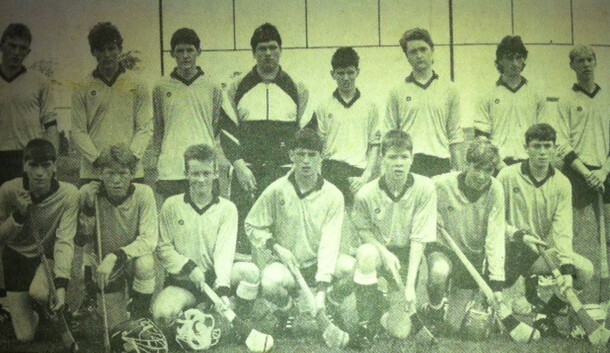 Front from left: John Tucker, Liam O’Gara, John Manley, Robbie Tomlinson, Shane Connolly, Declan Bailey and Kevin Tucker. Éire Óg had to line out without full-back David Creamer, bringing in Michael Loughnane in his place but had the boost of the return to wing-back of Shane Connolly. They opened the game with a flurry of points in the first five minutes, but as Holycross settled down the game becamse closely contested and at the interval Éire Óg were ahead by four points – 0-8 to 0-4. Holycross put on a lot of pressure in the second half but their weakness in the forward line was their undoing and they shot several wides from scoreable range. Éire Óg got off to a great start with a point after only 35 seconds by Declan O’Meara. Two minutes later he was on target again and was quickly followed onto the scoreboard by Pádraig O’Kennedy. Robbie Tomlinson put Éire Óg four points clear after ten minutes from a free. Holycross looked in deep difficulty as they lost Tom Moloney through injury, replacing him with Pat Doyle. But they pulled themselves together and David Burke sent over their first point after eight minutes. Four minutes later Robbie Tomlinson sent over a point from a free. David Burke responded with a similar score for Holycross. The sixth Éire Óg point came after eighteen minutes as John Manley doubled on a high ball from Mervyn Scanlon. Two minutes later Burke had a point for Holycross which Éire Óg hit back for a point by Tomlinson. Coming up to the interval Tomlinson and Burke swapped points as Éire Óg turned over 0-8 to 0-4 ahead. The second half was remarkable for its low scoring. Pádraig O’Kennedy gave Éire Óg the start they wanted after four minutes with a point. They nearly had a goal in the tenth minute when an effort by Liam Walsh close in was blocked superbly by James Ryan. On the quarter hour Declan O’Meara sent over Nenagh’s tenth point. Holycross pressed hard but sent three chances wides before David Burke pointed after 24 minutes. John Tucker wound up the Éire Óg scoring with a point a minute later, then Burke had Holycross’ last score a point. Two minutes from the end Christy McLoughlin brought off a fine save from Kevin O’Meara and any hope Holycross had of the title evaporated. Christy McLoughlin had a fine game between the posts for Éire Óg. Michael Loughnane slotted in well into the full-back spot. Eddie Guerin continued to show great promise as a defender. Mervyn Scanlon was very effective at midfield. Robbie Tomlinson led the attack with his usual skill, taking his scores well. Pádraig O’Kennedy and Declan O’Meara were also impressive. For Holycross Aidan Hassett, Philip Ryan, Paudie Lee and David Burke were best on the day. Éire Óg: Christy McLoughlin, Declan Bailey, Michael Loughnane, Liam O’Gara, Eddie Guerin, Frank McGrath, Shane Connolly, Mervyn Scanlon, John Tucker, Pádraig O’Kennedy, Robbie Tomlinson, John Manley, Declan O’Meara, Liam Walsh, Kevin Tucker. Holycross: T. Burke, A. Hassett, J. Ryan, J. Burke, T. Moloney, P. Ryan, M. Lee, R. Doyle, P. Lee, N. Ryan, D. Burke, K. O’Meara, J. Maher, B. Treacy, P. McGrath.